Introduction: Preparation of vital teeth involves the removal of sound tooth structure, which causes opening of dentinal tubules, thereby causing displacement of the dentinal tubular fluid, leading to dentinal hypersensitivity. After cementation of crowns in such teeth, incidence of pain and hypersensitivity has been reported. An extensive use of desensitizing agents has been observed over the past few decades because of the introduction of newer agents and the increased incidence of post-cementation sensitivity. Dentin desensitizing agents are commonly used in dental practice. But their effects on crown retention have been anecdotal. Materials and Methods: Thirty-three extracted human maxillary first premolar teeth were selected for the study, which were prepared using a special assembly and divided into three groups (i.e., GC + U, GC + G, GC) to compare the effect of Gluma (Heraeus-Kulzer, Germany) and Ultraseal (Ultradent, USA) on crown retention using glass ionomer cement (GIC). Results: It was observed that the group GC was statistically significant with the group GC + U. Conclusion: Of the two agents, Gluma may be safely used with the GIC, whereas Ultraseal is ill-suited to combine with GIC. Traditional therapy for restoring edentulous spaces before the introduction of implants to dentistry was and still very much is fixed partial denture, commonly known to the masses as “bridge.” Fixed partial denture is an invasive therapy. The selected abutment teeth may be vital or non-vital. Preparation of vital teeth involves removal of sound tooth structure. This exposes a number of traumatized dentinal tubules to the oral cavity. Approximately 1–2 million dentinal tubules are exposed during an average tooth preparation for a posterior crown. The dentinal tubules contain the odontoblastic processes of the pulp. Fluctuations in temperature and osmotic pressure bring about the displacement of the dentinal tubular fluid. This fluid movement causes stimulation of the nerve fibers in the pulp manifesting as pain. This is the Brannstromm’s hydrodynamic theory., Desiccation and frictional heat generated, during the course of preparation, only accentuate the problem and increase the likelihood of hypersensitivity. It is reported that approximately 1–2 million dentinal tubules are exposed during an average tooth preparation for receiving posterior crown. The geometric form of the prepared tooth and the casting mainly determines the retention of the prosthesis, but the clinical success of the restoration also depends on the integrity and the mode of attachment of the intervening cement layer. The various cementing media ranging from the traditional ones, such as zinc phosphate cement, to the newer resin-based luting cements have different modes of attachment to the casting and the tooth surface. Further, it has been documented that the pH of luting agents such as zinc phosphate cement and glass ionomer cement (GIC) is acidic. Studies have shown that the cement is forced into the tubules many a times causing irritation and pain to the patient. To protect the pulp, the “temporization” procedure is performed after the crown preparation. However, most temporary crowns display substantial amount of microleakage. This microleakage leads to irreversible pulpitis of a sound tooth. Such iatrogenic infection must be avoided at all costs. To address the dilemma of tooth sensitivity, dentists increasingly use bonding systems to seal dentine after crown preparation. An extensive use of desensitizing agents has been observed over the past few decades because of the introduction of newer agents and the increased incidence of post-cementation sensitivity. This is often carried out without the proper technical know-how. Two methods commonly used to reduce tooth sensitivity after crown preparation are: (a) application of calcium hydroxide suspension and (b) application of various sealing systems. The sealing systems are further subclassified into non-resin, low-filled resin, and highly filled resin sealers. Adhesives such as One-Step, Konstanz, Germany mechanically occlude open tubules with resin, thus sealing them from the oral environment. Primers, such as Gluma (HEMA and glutaraldehyde) (Heraeus-Kulzer, Germany), reduce hypersensitivity by the precipitation of plasma proteins in the dentinal fluid.,, A myriad of combinations of desensitizers and luting cements are available today to the dental clinician. The available literature offers inconsistent statistics on the effect when using various desensitizing agents with luting cements such as zinc phosphate, glass ionomer, and resin-modified glass ionomer. The purpose of this study was to evaluate the effect of two commercially available desensitizing agents, Gluma and Ultraseal (Ultradent, USA), on the retentive ability of GIC when used as a luting agent for full-coverage crowns. 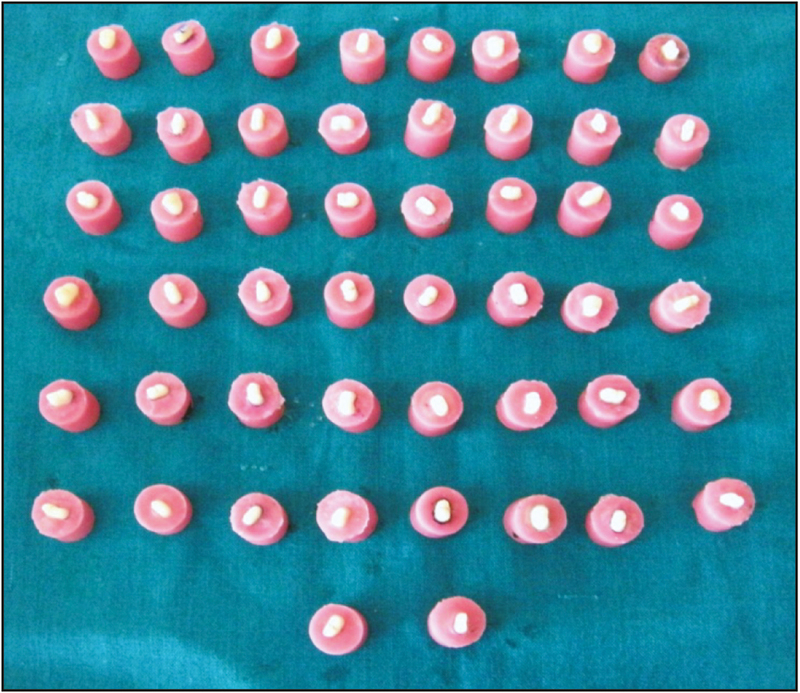 Thirty-three extracted human maxillary first premolar teeth were selected for the study. Only non-carious, non-restored teeth were chosen. Teeth were disinfected with 0.5% sodium hypochlorite and stored in distilled water. Roots were roughened and the teeth were mounted in a special circular jig fabricated for the purpose with cold cure acrylic resin. The teeth were mounted with the Cemento-enamel Junction (CEJ) 1mm above the cold cure resin. The entire procedure was carried out on a special assembly fabricated for the purpose and mounted on a Jelenko surveyor (Jelenko company, 300 Heraeus Drive, South Bend, IN 46614) [Figure 1]. The flat end tapering bur was used for the axial preparation and ensured a uniform convergence angle of 20degrees. A shoulder finish margin was given. The depth of the axial preparation was kept equal to the diameter of the tapering bur. The length of the preparation was 4mm above the CEJ. A new diamond point and finishing point were used for each sample for the purpose of standardization. An elastomeric impression of each prepared sample was made and dies were poured and labeled [Figure 2]. The axial surface area of each sample was calculated by an electronic scanner. The same procedure was repeated for all the samples. All of the above was carried out by one individual. The samples were then redistributed such that the total mean surface area of all the groups was the same. Die hardener was applied to each die, followed by a single layer of die spacer. This was followed by the application of die lubricator. Wax patterns were then fabricated by dipping the master die in a wax bath. Two coatings were applied, allowing previous layer to set. 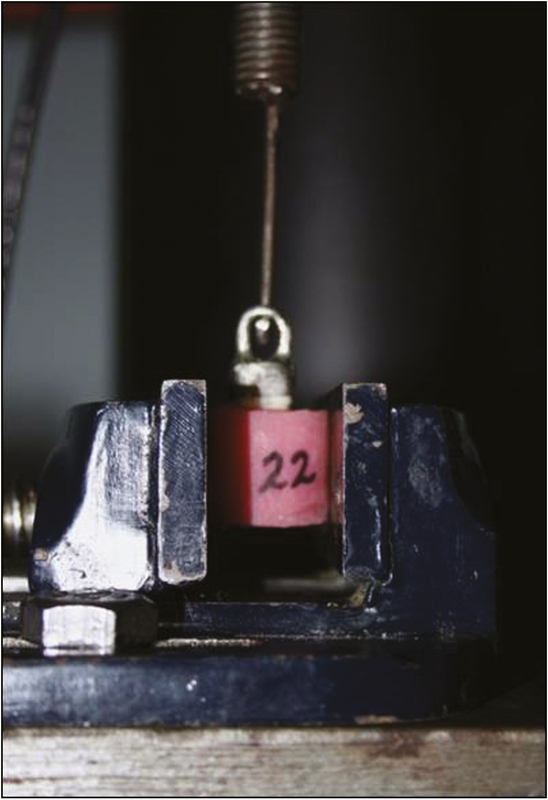 A wax loop was then attached to the wax pattern to facilitate the testing on a universal testing machine. The completed pattern with the loop was then invested and cast using base metal alloy to obtain individual coping [Figure 3]. Two dentin sealers (Ultraseal and Gluma) were used to seal the dentin. Crowns in the control group were cemented without any dentin sealer. The dentin was etched for 15s in 32% phosphoric acid and then washed for 20s. Moisture was removed and two coats of sealer were applied, allowing previous layer to dry. The application of desensitizers was carried out just before cementation. GIC was used. An electronic microbalance was used to ensure equal amounts of powder and liquid. The Resinomer (Conway avenue, st. Paul, USA) pastes were mixed as per manufacturer’s instructions. The castings were then lined with cement and seated using a loading machine, 20kg for 10min. The excess cement was removed before its final setting (10min). The specimens were then stored in water for 24h. To simulate stress, the crowns were thermocycled from 5°C to 55°C for 2500 cycles using a dwell time of 30s. A universal testing machine was used to dislodge the crowns. Axial dislodgement forces were then applied until failure at a crosshead speed of 0.5mm/min via a universal testing machine [Figure 4]. Both the dislodged crowns and teeth samples were examined for the type of failure under an optical microscope. The mean values and standard deviations of each treatment group were determined. The data were analyzed using one-way analysis of variance (ANOVA). Tukey’s honestly significant difference test was used to determine the significance of differences between the mean values. Type GC: control specimens luted with GIC (GC Fuji, GC Asia, Singapore). Type GC + U: specimens treated with Ultraseal dentin sealant and luted with GIC. Type GC + G: specimens treated with Gluma and luted with GIC. The specimens were hence divided into three groups, each comprising 11 specimens. Statistical analysis was carried out by one-way ANOVA initially to analyze the effect of the two desensitizing agents compared vis-a-vis the control group. It was observed that the group GC was statistically significant with the group GC + U. However, no such difference was observed between any other groups. Hence, the statistical significance correlated with the clinical significance [Table 1]. Dentinal sensitivity is a common finding but is often either underreported by the dental patient population or misdiagnosed; its prevalence has been reported to be as high as 14.3% of all dental patients, between 3.8% and 57% of the adult dentate population, and up to 30% of adults at some time during their lifetime. The greatest prevalence of dentinal hypersensitivity was reported between the third and fourth decades of life. Most commonly affected teeth are the upper premolars, followed by the maxillary first molars, with the incisors being the least sensitive. Excessive dietary acids, toothbrush abrasion, chemical erosion, gingival recession, exposed dentin, and digestive system disorders have been identified as the potential risk factors. Patients undergoing surgical or nonsurgical periodontal treatment are susceptible to hypersensitivity because of the loss of cementum or gingival recession. Also, patients might experience tooth sensitivity during or after the bleaching procedures. Tooth modification procedures on a vital tooth elicit pain and sensitivity. Depending on the extent of preparation, the pain may be mild, which is addressed by analgesics, to severe pain, which warrants intentional root canal. To deal with this agonizing issue, dentinal desensitizers were introduced. These range from lasers to a wide range of sealing systems and calcium hydroxide. Desensitizing agents may reduce tooth sensitivity by forming a thin barrier that protects the tooth structure from external insults, but then deprives the cement of micromechanical retention on the tooth structure., However, the surface roughness of the crown is yet available and the cements may interlock in them. It is imperative to remember that crown retention depends primarily on the taper obtained. The role of the cement is to fill in the space between the crown and tooth structure and protect against microleakage. Past studies have been carried out on All-Bond, One-Step, and Gluma., For this study, a resin primer “Gluma” from Heraeus-Kulzer and “Ultraseal” from Ultradent have been selected as desensitizing agents. Gluma is composed of glutaraldehyde (5%) and 2-hydroxyethyl methacrylate (35%). It is broadly used to treat cervical hypersensitivity, as a pretreatment to priming and bonding in direct composite restorations, as pretreatment before placing compomer or amalgam restoration, after crown and bridge preparation, and also before crown and bridge cementation or bonding. Ultraseal is a resin sealant from Ultradent. It is composed of non-polymerizable, high-molecular-weight resin in a volatile organic solvent. It forms a virtually impenetrable barrier against acids, cements, and restoratives. GIC has the property of bonding to the dentin. Bonding occurs via an ion-exchange mechanism and micromechanical penetration of dentin surface, and thus has both chemical and physical aspects. Over the past 14 years, numerous studies have been carried out to assess the effect of dentinal sealants on crown retention. However, crown retention was reduced when GIC was used. Another study that used both gluma and resin systems did not reveal a significant effect with GIC. However, another study by Johnson et al. in 2004 produced a surprising 55% increase in crown retention with GIC. Group GC used as control showed crown retention values higher than that of group GC + G and group GC + U. However, the difference between group GC and GC + G was not statistically significant. Group GC + G showed retention values lower than that in group GC but higher than that in group GC + U. However, neither of the difference was statistically significant. Combination of GC with Ultraseal showed the lowest values; the difference between group GC + U and group GC was statistically significant. This suggests that such a combination was undesirable and should be avoided [Figure 5]. Majority of the decementation tests resulted in an adhesive type of failure for all groups, ranging from mixed type to complete stripping of the cement from the tooth structure. Crown retention values for Ultraseal and GIC decreased in this study; this was also in accordance with the past results obtained by Mausner et al. It must be added at this conjuncture that specific brands selected were representative of a broad range of products within the classification. As only a single product for each classification was tested, a global statement cannot be made. However, it is expected that the general trends and concepts developed in this research will be valid for a number of products within the category. Dentinal sensitivity either delayed or immediate is often reported by patients with vital teeth undergoing tooth modification procedures.,, Some practitioners even prefer to carry out an intentional root canal therapy as they consider it to be the inevitable. Desensitizing agents not only provide relief against postoperative pain but also form a thin protective barrier that protects the vitality of the pulp. Use of desensitizing agents provides a logical and economical answer to address this problem. A combination of Gluma with GIC resulted in a decrease in crown retention values but with no significance. Gluma therefore may be safely used with the GIC. Application of Ultraseal desensitizing agent to GIC resulted in a decrease in crown retention and was statistically significant. This leads to a conclusion that Ultraseal is ill-suited to combine with GIC. The major mode of failure was of adhesive in nature with the cement being retained on both the crown and the tooth structure. Scurria MS, Bader JD. Meta-analysis of fixed partial denture survival: Prostheses and abutments. J Prosthet Dent 1998;79:459-64. Shillingburg HT, Hobo S, Whitsett LD. Fundamentals of Fixed Prosthodontics. 3rd ed. Batavia, IL, USA: Quintessence Publishing; 1997. Richardson D, Tao L, Pashley DH. Dentin permeability: Effects of crown preparation. Int J Prosthodont 1991;4:219-25. Brannstromm M. Dentin sensitivity and aspiration of odontoblasts. JADA 1963;55:366-9. Brannstromm M, Linden LA, Astrom A. Hydro dynamics of the dentinal tubule and pulpal fluid: A discussion of its significance in relation to dentinal sensitivity. Caries Res 1967;1:310-7. Garberoglio R, Brännström M. Scanning electron microscopic investigation of human dentinal tubules. Arch Oral Biol 1976;21:355-62. Kaufman EG, Coelho AB, Colin L. Factors influencing the retention of cemented gold castings. J Prosthet Dent 1961;11:486-502. Smith DC, Ruse ND. Acidity of glass ionomer cements during cementation and its relation to pulp sensitivity. JADA 1986;112:654-7. Carlsson GE, Omar R. Trends in prosthodontics. Med Princ Pract 2006;15:167-79. Wolfart S, Linnemann J, Kern M. Crown retention with use of different sealing systems on prepared dentin. J Oral Rehabil 2003;30:1053-61. Langland H, Langland LK. Pulp reaction to crown preparation, impression, temporary crown fixation and permanent cementation. J Prosthet Dent 1965;15:129-43. Felton DA, Bergenholtz G, Kanoy BE. Evaluation of the desensitizing effect of gluma dentin bond on teeth prepared for complete-coverage restorations. Int J Prosthodont 1991;4:292-8. Dondi dall’Orologio G, Malferrari S. Desensitizing effects of gluma and gluma 2000 on hypersensitive dentin. Am J Dent 1993;6:283-6. Bergenholtz G, Jontell M, Tuttle A, Knutsson G. Inhibition of serum albumin flux across exposed dentine following conditioning with GLUMA primer, glutaraldehyde or potassium oxalates. J Dent 1993;21:220-7. Camps J, Pizant S, Dejou J, Franquin JC. 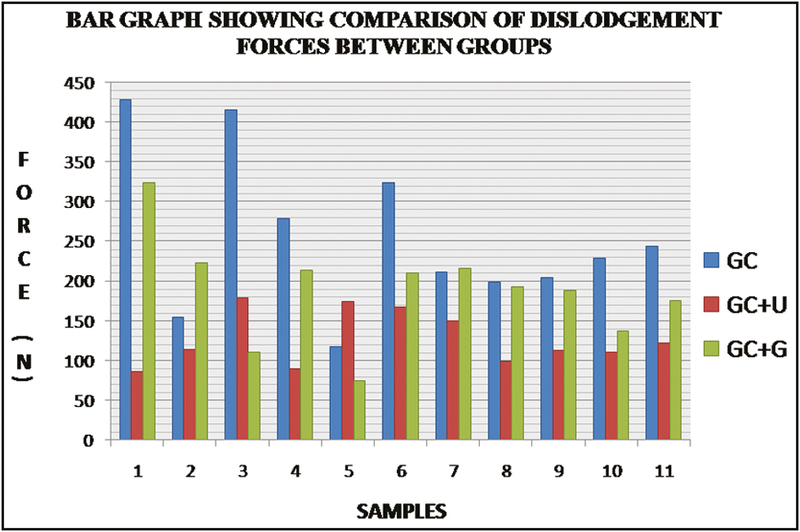 Effects of desensitizing agents on human dentin permeability. Am J Dent 1998;11:286-90. Sucheta A, Keshava Prasad BS, Apoorva SM, Lakshmi P. Dentinal hypersensitivity—A review. Indian J Dent Sci 2013;2:112-6. Available from: https://www.ultradent.com/en-us/Dental-Products.../UltraSeal-XT. [Last accessed on 2018 Nov 24]. Kenneth Anusavice. Phillip’s Science of Dental Materials. 10th ed. Amsterdam, The Netherlands: Elsevier; 2002. Maldonado A, Swartz ML, Phillips RW. 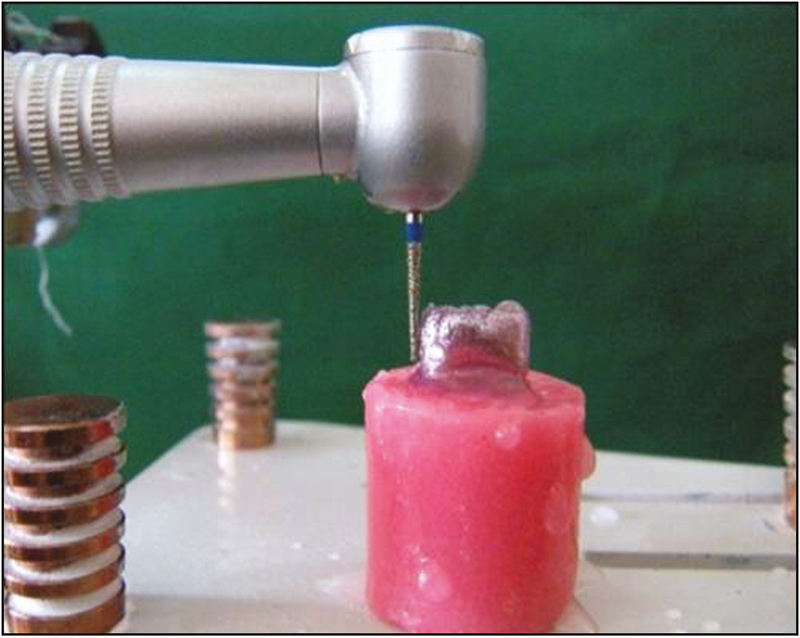 An in vitro study of certain properties of a glass ionomer cement. J Am Dent Assoc 1978;96:785-91. Mausner IK, Goldstein GR, Georgescu M. Effect of two dentinal desensitizing agents on retention of complete cast coping using four cements. J Prosthet Dent 1996;75:129-34. Swift ER, Llyod AH, Felton DA. The effect of resin desensitizing agents on crown retention. JADA 1997;128:195-200. Johnson GH, Hazelton LH, Bales DJ. Crown retention with use of a resin sealer on prepared dentin J Dent Res 1996;191:8-257. Reinhardt JW, Stephens NH, Fortin D. Effect of gluma desensitization on dentin bond strength. Am J Dent 1995;8:170-2. Online since 12th October 2018.